Whiteside bowl tray router bits are carbide tipped double fluted plunging bits for making hardwood serving bowls, trays and shallow dishes. 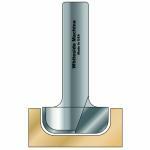 Whiteside bits help control depth of cut while minimizing kickback. Choose from the available shanks and diameters below to add new Whiteside Bowl Tray Router Bits to your collection of woodworking tools today. 7/16" 1/8" 5/16" 2-1/8" 1/4"
3/4" 1/4" 5/8" 2-3/8" 1/4"
3/4" 1/4" 5/8" 2-3/8" 1/2"
1-1/4" 1/4" 1/2" 2-1/4" 1/2"